IIIab klasės mokiniai anglų kalbos pamokų metu atliko vertimus į anglų kalbą apie mūsų Kėdainių krašto žydų gelbėtojus. IIIab class students translated the texts about Jewish rescuers of Kedainiai district. Juzefa Rimavičienė (break in 1883) – a rich widow with three kids, lived in Pėdžiai village, Kėdainiai district. Her oldest daughter Liudvika was married Petras Gedaika and they lived in neighbourhood. Before WW II both famillies felt really good feelings for Jewish people who loved near them in a small town – Vandžiogala, Kaunas bistrict. When Germany occupation started, Gedaikai and Rimavičienė wanted to help them as soon as possible. Before the occupation started the Gedaikai was hiding two brothers Josifas and Chaimas Lisonai. Dimavičienė house had a toilet outsidethe home where artificial wall was built as behind that wall Jewish brother were hiding still the occupation ended. Chaimas Ronderis from Kėdainiai, sometimes was hiding in their homes either. In 1942 Petras and Liudvika accepted the refugee Chaja Levnovskytė who lived in Vandžiogala. She wanted to be safe, so she changed her hiding places. When she left Gedaikai family, she hid in Juozas and Ona Augustinavičiai house, they both with their hids lived near Kedainiai. Almost half your Levnosvkytė was hiding in their eaver, sometimes in a cellar. Augustinavičiai family helped Chaimas Kunderis either. After the war Chaja and Josefas moved to Izreal, Chaimas Lionas moved to USA, but Chaimas Ronderis and Chaimas Kunderis stayed in Lithuania. Pertas Gedaika, Liudvika Gedaikienė, Juzefa Rimavičienė, Juozas Augustinavičius and Ona Augustinavičienė were awarded The Righteous Medal. Translated by Simona & Monika T.
In 1943 work camp was found in Kedainiai. The Jews, who worked in the camp wanted to escape from there. Security wasn‘t very strict in the cam and German supervisors who didn‘t work in gestapo let the Jews search for food. The Jews used these opportunities and got acquainted with local people. In 1943 summer Josifas Gartneris left the camp and met with Vincas and Stase Antanaviciai in Kujenai village. They were poor farmers and lived with their children – Jonas and Veronika.Antanaičiai adopted Gartner to their home and have agreed to help save more Jews from the camp. When Gartner was going to save and bring more Jews to Antanaičiai home, owner warned Gartner that if they get caught, the Germans could kill his family. But added that he will provide asylum for Jews. Soon Antanaičiai home became asylum for Jokubas and Chaimas Bursteinas, Simonas Joffei, Slomas Grosmanas, Liuba Velkikoliudaite, (later – Burstein), Frane Hades and Fane Rasaite. Later, these Jews joined Soviet partisans and after war many of them emigrated to Israel. Farmers Jeronimas (1883) and Adele (1901) Ziuzniai lived in Sviliu village near Kedainiai with Zenonas Grigaitis, Adele’s sun from first marriage Ziuzniai knew Gelas family very well, which lived in Kedainiai.Gela’s family had a mill and a hardware shop, and Ziuzniai were their regular costumers .When Jewish occupation started, Gelas family was placed in Kaunas ghetto. In 1944 of January Chaja Geliene secretly escpaed from ghetto , when reached Ziuzniai property and asked for help. Ziuzniai accepted to hide Gelas with a few friends and relatives. One night Jeronimas and his step son arrived to Kaunas, it was 60 km away from their village, they were waiting near fence of ghetto in tumbrel, while Chaja’s brother’s wife Chasia Geliene with her two little children Rachele and Jokubas crowled through the hole in the fence . All three of them were wearing heavy winter clothes and were taken to Ziuzniai property and were hidden in the shed. After a few days Izraelis Gelas, Chasios husband joined them and in February - some more Jewish : Boruchas Intriligatorius, dr. Dovydas Richmanas, Akiva Zaicevas , Codekas Bleimanas and Abraomas Rafaika .Shed were to small for them , so Jeronimas and Zenonas dig pit under it and there Jewish hided till German occupation end in 194 of August Adele Ziuzniene give them food and care for hygiene. Ziuzniai hided 14 adults and 2 children Jewish. After rescue Izraelis Gelas was soviet appointed to work in Sviliai mill. In 1945 of Jun he and his wife Chasia were murdered by Lithuanian partisans, also threaten to deal with Ziuzniai family for Jewish hidening. Rescues have to run away from village and find where to live in dr. Dovydas Richamans apartment in Kaunas for six weeks. During this time threaten partisans were distracted and Ziuzniai came home . Other rescued Jewish left from the Soviet Union and went to Israel and United States. 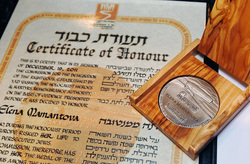 In 1944 of April 10 Jad Vaseme Jeronimas Ziuznys, Adele Ziuzniene and Zenonas Grigaitis were awarded for nomination of “ World nation righteous names”. Near old town I met two gymnasium teachers. They were in good mood. I saw barbed wire around the Smilga street and when I asked why barbed wire is here, their faces turned different. There was ghetto. To my question what Jews have done that Nazis separated them from home, I did not get the correct answer . In the morning keeper said, that director ordered to find people group who will be trained for serve to Nazis. When I came back to town I saw how two Germans soldiers banish Jews group. All Jews have yellow patch. Our flat was near airfield. We in morning saw that Germans soldiers banish Jews groups to airfield and in the evening banish them home. Human screaming is heard near car hum sound . Human screaming sound is full of pain. There was old people and childrens. They all screaming, crying. I can’t believe that old people and childrens are transported to ruin. The truck turned towards Dotnuva. There was Jews ending place. Empty car come back to ghetto. Before long it is full of other jews again . No one of them askes for help because they know nobody will help them . Near Smilga river was new cemetery. After this jews killing some people changed their mind and started to think otherwise. Everyone worry about future.